Traveling Sardine Class: We'll take some of that extra rain and snow . . .
Clouds. Glorious clouds when I went out to the car to head to NeedleCrafts this morning. There've been days and days of sun and drought. We're on track for the worst drought since . . . . I hear since the 1970s, then a hundred years, maybe ever. Another big snow like we had in December would be good. It would release its water softly into parched soil. Earlier this week, I got onto the coffee table project. That's the one that came in a box that weighed a pound and a half more than I can lift. I rolled it into the space beside where it will live on my heavy-duty dolly. Took out and counted all the parts. Sister gave me a gift one year of boxes that look like big books, in hopes that I'd keep my incoming mail in them and not scattered about the coffee table or the rest of the room. Stacked, they were exactly the right height to support the bottom shelf while I screwed it into the legs. Et voilà. New couch and new coffee table. I have chairs coming to replace the old love seat. Back to Thursday at NeedleCrafts, Sandy is working on one of the embroidered greeting cards our visitor from Montana taught them to make last week. Two of our ladies who arrived a little late reported that two rain drops had hit their windshield as they drove into The Little House where we meet. 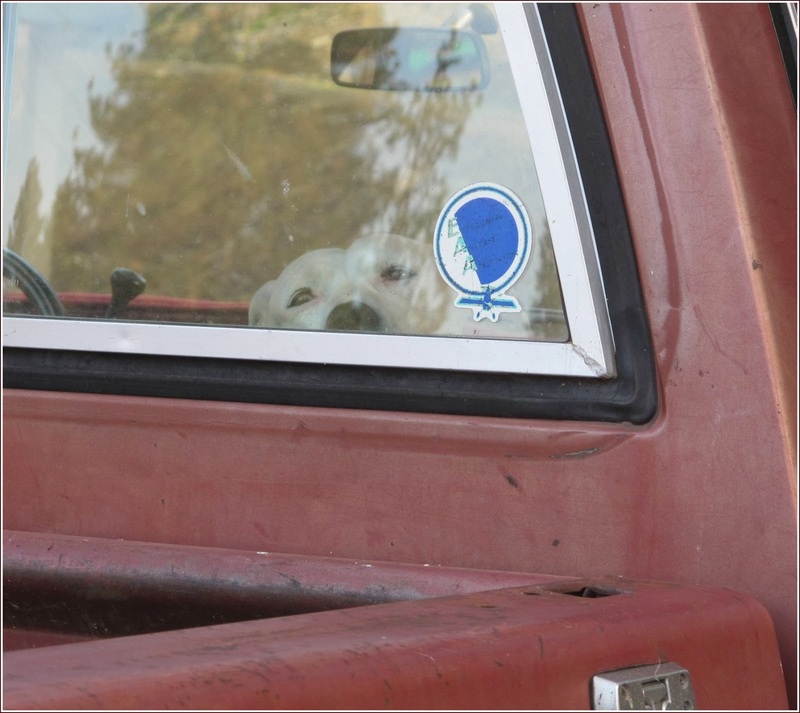 Stopping at the grocery store on the way home, I met a dog in a truck. It looked at me out of the open driver's side window as I walked past the truck. It's eyes seemed to plead with me not to come too close to the truck, because it really didn't want to masquerade as a guard dog. It rested its chin on the back of the seat, watching me as I put my groceries in my car. The sky stayed gray for my trip home, not as beautiful as it had been earlier in the day. I got out of the car and walked down the driveway to pick up my newspaper. I didn't want to forget to bring it in as I noticed it wasn't wearing a little newspaper raincoat. Squee! I spotted rain drops on the pavement. Look! See!